A hearty breakfast of champions! Start your day off the Irish way! You'll never want cold cereal again. To be really authentic, buy back bacon--it's much meatier than the belly bacon Americans eat. And it's absolutely essential that you serve this breakfast with sweet, milky tea. I love this recipe!! I have made it several times before and whenever I want breakfast for dinner irish breakfast is the first thing that pops into my head. For a truely authentic experience you'd need to find some black or white pudding, and for a truely magnificent hangover cure add baked beans and lashings of tea and toast. What size skillet does Prue have? The only thing this needs is some black and white pudding and some potatoes! What an awesome meal. My husband & I had it for dinner and we love it. 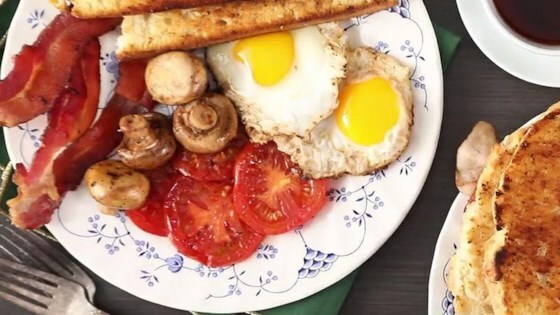 It's unique in that it includes veggies, which American breakfasts almost never do. Quick & easy too!